The Good Kind of Bad is a thriller that doesn’t let up all the way through to the very end. The main character, only ever referred to as Mrs Petrozzi, has married Joe Petrozzi on impulse just three weeks after meeting him. She has fled what appeared to be a perfect life in the UK after leaving her fiancé, Will, at the altar. Joe could not be more different from Will. He’s a brawny, tattoo covered delivery driver living in a cramped, dingy apartment in a dodgy area of Chicago. Rather than being in love with him, it seems that lust and recklessness has played a large role in her decision to marry so quickly! At first I wasn’t sure that I was going to like Mrs Petrozzi much. I mean, who marries someone so soon after meeting? I know some people probably do and may go on to have long and happy marriages but it doesn’t seem to me like the best start to a relationship. She literally knew absolutely nothing about Joe’s life, his past, his family. But to be fair, she hadn’t told him much about her life either. It soon becomes clear though that she has made a huge mistake as Joe unexpectedly turns violent towards her, clearly has a drinking problem and begins to reveal some of his past which includes run-ins with the police. At this point I started to feel sorry for her – what had she got herself into? Before long, it is obvious that her life may be in danger but perhaps there may be some hope in her friendship with Nina and police officer Evan. Throughout the book I mostly felt fearful for Mrs Petrozzi. The book races along at a cracking pace with shock after shock and things just going from bad to worse for her. Like her, I could feel the disbelief at everything that was happening and could sense her terror. This is quite different from the kind of books I usually read but I was totally caught up with the story and couldn’t put it down, wondering how on earth she was going to get out of this nightmare scenario she found herself in. 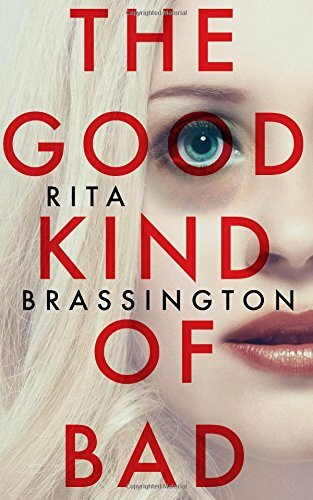 Rita Brassington has written a really fast paced thriller (which I think would make an excellent film incidentally) and has somehow manage to keep up the action right to the very end. There is so much going on and so many twists that you barely have time to catch your breath before something else happens! An excellent debut and one I recommend to anyone who likes a thriller that really will have you on the edge of your seat. Secrets don’t stay secret for long… She spent her whole life being the perfect daughter, the perfect girlfriend, and was all ready to become the perfect wife. But after ditching her fiancé at the altar and escaping to Chicago, she marries smouldering stranger Joe Petrozzi three weeks after meeting him in a bar. At least this time, there’s no chance of cold feet. Married life starts out great: there’s the new job, a gorgeous, enigmatic husband and money’s not an issue. So what if she’s kept a few secrets from Joe – like where all her money came from. Joe’s been keeping secrets from her, too. But his might just get her killed. This sounds really good, I love your review particularly as you were a little sceptical at first. Great review, as always. It’s not really my sort of read but your review does have me intrigued.